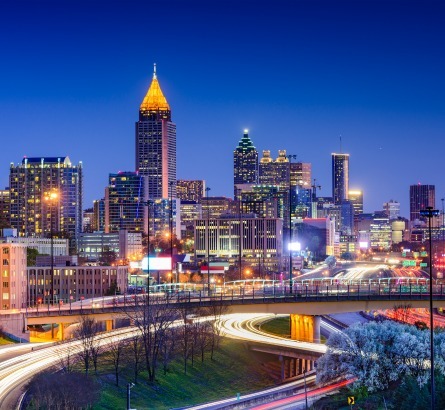 Home to Coca-Cola headquarters, the world’s largest aquarium, and the world’s largest drive-in restaurant, Atlanta hosts a myriad of unique destinations sure to impress travelers of all backgrounds. The classic southern hospitality alone is sure to charm any newcomer, while the history, beauty, and endless food destinations only offer more reasons to stay and explore. If you’re worried about how you might get around, Falcon Charter Bus provides transportation to groups of all types, from wedding guests to business travelers to senior citizens and more. We specialize in finding the perfect bus accommodations based on each group’s specific needs, so you’re always paired with the best bus for your group and a professional, experienced driver. Though you can’t see it all in just 3 days, we’ve tried to combine our passengers’ favorite Atlanta destinations into one sample itinerary. Check off all of the “tourist traps” that still make the city unique with some of the suggested stops below, plus some food recommendations that you’ll only find in Atlanta. MARTA, Uber, and Lyft are at your disposal, but when you’re traveling with a large group of people, you risk splitting up your group or stressing over lost members when you use public services. A coach from Falcon Charter Bus will allow everyone to travel together to every stop, ensuring that you’re always on the same page. With minibuses, full-sized charter buses, and multiple sizes in between, we’ll find one that suits your group perfectly so that you can comfortably travel to any Atlanta destination. As a plus, you’ll be able to set your own itinerary ahead of time based on what you want to see. We’ll send your itinerary to your driver so that you’ll always have a ride when it’s time to move from one stop to the next. As the second-largest aquarium in the world, these 10 millions gallons of water filled with whale sharks, manta rays, beluga whales, and thousands of other aquatic species are sure to wow visitors of all ages. Just next door to the Georgia Aquarium, the World of Coke showcases the history of the world-famous soda through unique exhibits. Finish your visit by sampling Coke products from around the world in the popular tasting room. The historic “Fabulous Fox” Theatre can’t be missed on your first trip to Atlanta. From a casual summer movie night to a formal Christmas-time viewing of the Atlanta Ballet’s yearly “Nutcracker” production, there’s always something exciting happening at the Fox. As the birthplace of Martin Luther King, Jr., the city of Atlanta played a key role in the Civil Rights Movement of the mid-20th century. This new museum highlights the achievements of the movement and brings attention to broader issues regarding human rights worldwide. Located in Midtown’s Piedmont Park, the Botanical Garden offers 30 acres of beautiful gardens and unique plant life, including a Japanese garden, a rose garden, and woodland areas. If the weather’s nice, head over to Piedmont Park to enjoy a nice stroll or a special event. Enjoy a beautiful nighttime view of the skyline from within a comfortable, climate-controlled gondola. It’s more than just a simple ferris wheel ride, though-- the wheel also offers special field trip opportunities, event hosting, and VIP gondolas for special occasions. With a permanent collection of 15,000 works spanning across 7 exhibits as well as yearly traveling special exhibitions, the High is one of the top art museums in the U.S. and a must-see for all Atlanta visitors. They even offer free admission on the second Sunday of every month! As one of only four U.S. zoos to house giant pandas, Zoo Atlanta can’t be missed. You’ll also find gorillas, a komodo dragon, naked mole rats, tigers, orangutans, and more, making the Zoo a fascinating stop for visitors of all ages. Spend an evening shopping, eating, and strolling at Ponce City Market, built in a refurbished Sears, Roebuck & Co. building. With plenty of upscale shops and opportunities to taste local beers and wines, PCM is a great place to relax and knock out some souvenir shopping. The Varsity is a staple of Atlanta restaurants and one of the most-recognized landmarks in the city. Treat yourself to a hot dog, a bacon cheeseburger, fries, or a classic frosted orange at this historic 90-year-old restaurant. Although it’s known as the world’s largest drive-in restaurant, there’s plenty of room inside for everybody in your group. Get a taste of classic Southern cuisine at Mary Mac’s Tea Room in Midtown. Some of Atlanta’s best fried chicken, country-fried steak, fried okra, cornbread, black-eyed peas, and macaroni and cheese are just a few of this historic restaurant’s delicious offerings. Located atop the Westin Peachtree Plaza, the Sun Dial offers a gorgeous 360-degree rotating view of the city of Atlanta. Enjoy a splurge with either their permanent or seasonal menu while you take in the scenery from 72 stories above the street. Falcon Charter Bus specializes in transportation arrangements for groups of all types. Rely on us to make your first trip to Atlanta an unforgettable one with the perfect bus rental, an efficient booking process, and a team of dedicated reservation specialists available 24/7 to help secure your bus. With service extending to Charlotte, Nashville, Tallahassee, Miami, and more, it’s easy to travel into the city from anywhere in the Southeast. Give us a call today at 404-400-3545 to get started on your rental and receive a free quote!